Procedure for participation / Komazawa Olympic Koen Park HUGE Flea Market. Please DO NOT OCCUPY BOOTHS before you get a certificate to attend. Please do not forget it is an event for promoting reuse of things, not for merchandising (It is prohibited by Local Gov.). We are planning to start the reception at about 8:00. Please prepare an ID and walk in line to attend. The fare would be 2500 yen per booth. If you do not have a reservation, you must wait till 9:00 to apply. The fare for non-reservation customers would be 3000 yen per booth. We strongly recommend you to make a reservation from the next time. We publish a certificate to attend including your ID number. Now you can choose a vacant booth. Younger ID numbers would be superior to older ones in a case of collision. If you find someone occupy a booth before he (or she) is filed, you could notify us to move him (or her). it is not allowed to use a tent or a tarp in a flea market booth (It is prohibited by Local Gov.). 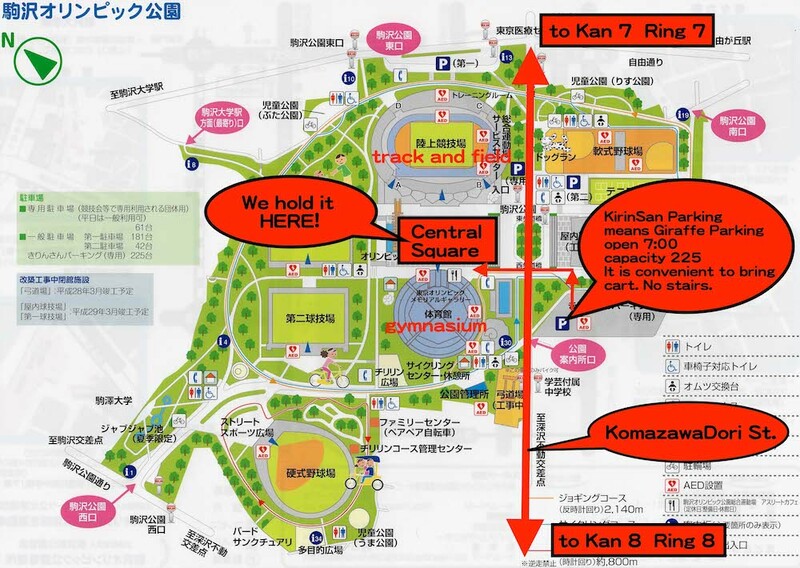 This map above is quoted from "Guide Map of Komazawa Olympic Koen Park".